Lochside is another distillery whose reputation seems to have been made after its closure. 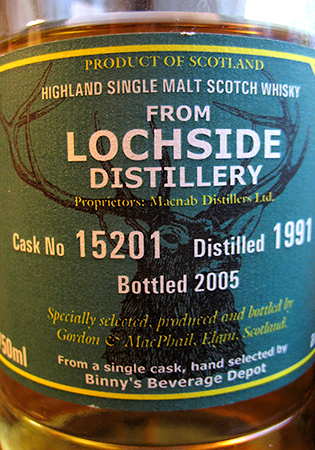 Indeed, the Malt Maniacs’ Monitor lists very few Lochside bottlings released before the distillery’s closure in 1992. As my own experience with Lochside is close to negligible, I am in no position to gauge to what degree this reputation may be borne aloft on the diffuse vapours of romance and nostalgia. And as the supply of Lochsides from indie bottlers seems already to be drying up, it may well be that I will not have the chance to investigate very deeply. If you do want to try Lochside at its best, the magic year is supposed to be 1981 (I have already expressed my reservations about magic years here). The whisky I am trying tonight is not from that year, but from 1991. It is from a single cask bottled by Gordon & Macphail for Binny’s in Chicago.